Avaya had a wildly popular wireless phone known as the 3810. It was so popular that we still get a lot of inquiries for it. The Avaya 3810 was discontinued in 2011 but thanks to the internet, it’s possible to search for anything. 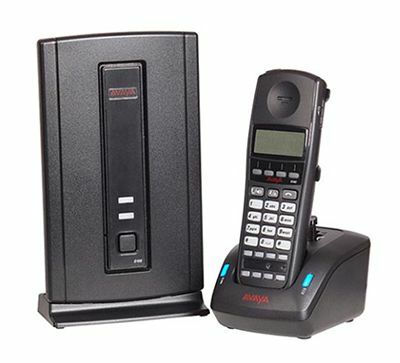 To answer the need, Avaya introduced the D100 SIP DECT wireless phone system. It is a really slick system that can be managed via the IP Office Manager without any additional configuration needed. The range of the base station is between 100~350 feet indoors and up to 700 feet in the open. We all know there are many factors that work to decrease wireless signal strength, so Avaya addressed this through repeaters that can be added to the system, each with its own 100~350 feet coverage range. You can add up to 6 repeaters on the system to get more coverage. The repeaters don’t require any additional wiring – just a plug – so it’s a really nice solution. Each base station can connect with up to 8 Avaya D160 handsets, and you can connect up to four base stations per IP Office installation. Since the system is integrated with IP Office, the handsets support IP Office features like Busy Lamp Field (BLF), Message Waiting Indicator (MWI), hot desking, emergency calls, programmable buttons and more. The D160 handset offers a handsfree mode, and you can also use a corded headset like the Plantronics MX500C which plugs into the headset jack. Unfortunately there’s no Bluetooth option but all in all, the handset’s a solid performer. For many companies using IP Office, the D100 system is what we recommend for their wireless solution. It’s a plug-and-play solution that provides lots of flexibility and features. If you’re looking for wireless freedom with your Avaya IP Office phone system, check out the Avaya D100 wireless phone system. This entry was posted in Avaya, Avaya IP Office, Avaya Wireless Phones, cordless phone, cordless telephone, IP Office phones, wireless phone system and tagged avaya 3810, avaya d100, avaya d160 handset, Avaya IP 500, Avaya IP Office, wireless phone system on April 15, 2016 by jjackson. The past couple of posts have been talking about Cisco’s desktop IP phones, so I thought I’d take a moment to talk about their mobile IP phone offerings. 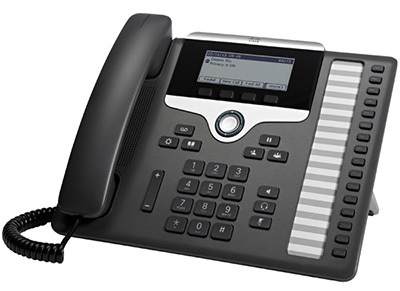 There are three Cisco wireless IP phones available at this time: the 7925G, 7925G-EX and 7926G. Each of them is built to last, having at least an IP54 rating for dust resistance and splashing water resistance. The cases are hermetically sealed and the phones comply with military 810F standard against drops and shocks. All three phones connect to the Cisco phone system over the WiFi network, so your range is only limited by the range of your company WiFi network. This is a great feature and will come in handy for those working in facilities where WiFi coverage is ubiquitous. It’s also good for those who are teleworkers at home offices. 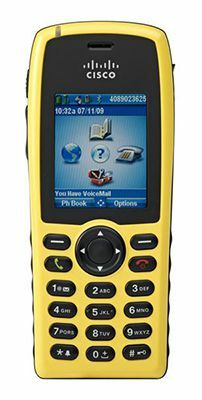 The phones also have Bluetooth 2.0 so you can attach a wireless Bluetooth headset and work hands-free. A 2.5mm headset jack is also available so you can use a corded headset if you prefer. For those working in the oil and chemical industries, or in other potentially explosive environments, Cisco’s 7925G-EX model (pictured right) is probably your best choice. In addition to all the other features, the 7925G-EX has Atmospheres Explosibles (ATEX) Zone 2/Class 22 and Canadian Standards Association (CSA) Class I Division II certifications. 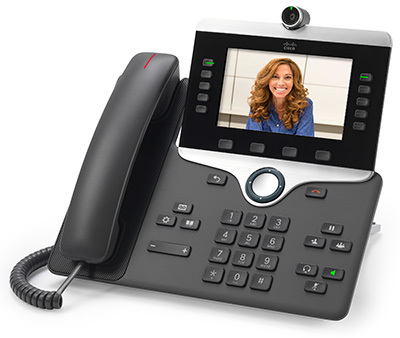 Cisco’s 7926G wireless IP phone has an additional feature: a built-in 2D bar code scanner. Great for workers in warehouses and anywhere bar code scanning is needed. All in all, if you’re on a Cisco phone system and are looking for more freedom from your desktop, consider the Cisco 7900 wireless IP phones. They’re packed with features and will keep you on the move. This entry was posted in cisco, cisco 7900 unified ip phones, cisco ip phones, cisco sip telephones, wireless phone system and tagged 7926G-EX, cisco, cisco wireless IP phone on April 13, 2016 by jjackson. If you’ve read any literature from Cisco, you’ll know they refer to their phones as collaboration endpoints. Seems like a hi-filutin’ way to talk about a phone. At least, it would seem that way at first glance. After all, a phone’s a phone’s a phone. Right? Cisco would be happy to prove you wrong, as their IP-based 8800 series of phones, I mean, Collaboration Endpoints do their utmost to help you communicate clearly and effectively. And if you’re lucky, your work involves producing or creating something of value. So, a Cisco phone may be just what you need to help you collaborate with your co-workers. Take Cisco’s 8865 IP Phone. It’s a video phone, digital camera, phone, speakerphone, and uses Bluetooth to connect to your mobile phone or a Bluetooth wireless headset. You can route voice calls from your mobile over to your desk phone with this system. You can also continue to use your wireless Bluetooth headset from one device to the other. Sounds great, but who’s going to use all this stuff? As it turns out, there’s pretty much something for everyone in here. Consider Millenials. Studies have shown Millenials don’t like desk phones. Many prefer their smart phones over a desk phone. More importantly, how they communicate shifts, as they will start a discussion via text, then transition to a video chat, and then to messenger or text chats again. IP phones with video capability that can interface with smartphones may be important to Millenials as they shift into office-based knowledge-worker roles. On the video side of things, being able to see the person you’re communicating with makes it easier to communicate clearly, build trust and enhance long-term relationships. Whether it’s with customers or co-workers, communicating clearly is a necessity. When you consider that 70% of communication is non-verbal, the importance of video communication increases greatly. Forward-thinking businesses recognize that video communication can provide a significant competitive advantage and increase staff productivity. When you next hear the term “Collaboration Endpoint”, you might want to think of it differently. Perhaps you’ll think of it as a tool that helps your team communicate clearly with customers and each other, that gives your business a competitive advantage and that meets the communication needs of the newest to the most senior people in your organization. This entry was posted in cisco, cisco ip phones and tagged cisco, cisco 8800 series ip phone, cisco ip phones, collaboration endpoint on April 4, 2016 by jjackson.